We will try to help you if you email us with your needs however; we will add a finder's fee to the cost of any part we located for you. Your best bet is check eBay motors frequently but beware of a couple of things. Some sellers tack on very high shipping fees and a few will misrepresent what they have. There are also many sellers out there that know little about these older Hondas and will list parts with incorrect application descriptions. I've seen a seat, for example, listed as fitting CA77's, CB77's, and CL77's. Since these have vastly different mounting arrangements, this is physically impossible. There are many very good suppliers of new and used parts out there. Check under the Sources section for a partial list we've put together. Tires! For your restoration or racer. Click here to see more pictures and read about some great street and performance tires from Heidenau Tires. They are available in sizes 2.75-18, 3.00-18, 3.25-18, and many others. Seat pan, looks good no damaged mounts and little rust. Chain guard, some minor easily repairable damage. Anything else you see in the picture except the head and carburetors. 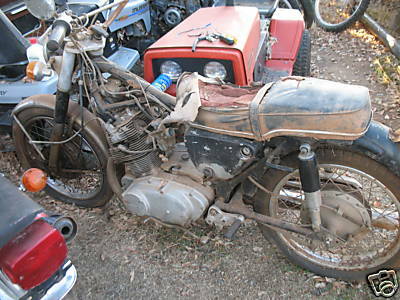 CB360: 2 spare engines, a cracked frame, a couple of wheels with aluminum rims, and other odds and ends. CB/CL/SL 175: a disassembled SL175 with rusty tank and no seat. Some CB and CL stuff.